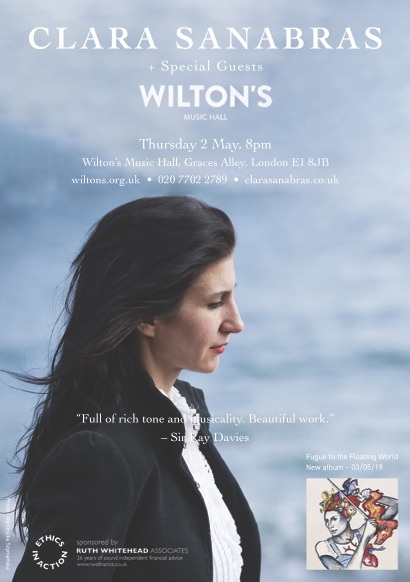 Clara Sanabras will launch of new album, ‘Fugue To The Floating World” on May 2nd at London’s famed Wilton Music Hall. A stunningly diverse collection of songs, it was written as a meditation on the transient world of love and magic. ‘Fugue to the Floating World’ has a lush and unique cinematic folk sound, an otherworldly quality that pushes the boundaries of folk music allowing for a colourful and vibrant, yet never obtuse sonic exploration, taking in elements of Jungian psychology, archetypal mythology, and ancient teachings. Featuring Irish guitarist Jimmy Smyth, the album is a collection of confessional love songs, its title derived from several meanings – the concept of a fugue as both a musical form, and the mental state of a ‘fugitive mind’; as well as descriptions throughout several cultures of ‘the floating world’ drawn from eastern literature through to Lewis Carroll’s Wonderland. Written whilst also collaborating with legendary The Kinks songwriter Sir Ray Davies on a 50th anniversary reimagining of The Village Green Preservation Society, ‘Fugue To The Floating World’ the latest in a formidable and diverse repertoire that demonstrates a uniquely versatile artist.